NEWS: Finest Kind has a new Christmas CD, We are now taking orders here. Song lyrics are here. For tickets and information for the "Finest Kind of Christmas" show, go to the Black Sheep website. Finest Kind is the remarkable folk trio from Ottawa, Canada whose exquisite harmony singing and brilliant vocal arrangements have brought a fresh sense of excitement and discovery to the performance of old songs. The trio's glorious sound, served up with easy-going humour, won a devoted following across North America. The trio stopped touring in 2015, but continue to present their much-loved annual Christmas show at the Black Sheep Inn in Wakefield, QC. Thrills and Chills...Finest Kind's vocal arrangements are a creative tour de force. Tradition-based yet curiously modern, the trio's harmonies are an enchanting feast of opulent chords and ever changing textures. The trio's amazing vocal blend has been called "molecular bonding" by one reviewer: "Any closer," he says, "and they wouldn't be allowed to do it in public." Audiences invariably mention "goosebumps." 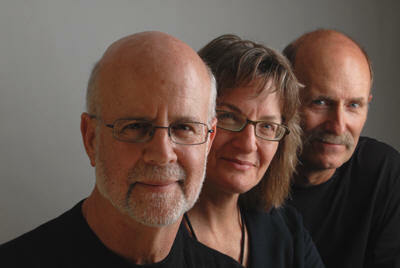 Who we are...Finest Kind was formed in Ottawa, Canada, in 1991 by Ian Robb, Ann Downey, and Shelley Posen. Ian, originally from London, England, is renowned as one of North America's most gifted performers of British folksong, a concertina player extraordinaire, charter member of Toronto's Friends of Fiddler's Green, and composer of folk standards such as "The Old Rose and Crown." Ann, who hails from the southwestern U.S., plays guitar, banjo, and bass, and has performed in bands playing old-time and cowboy music, bluegrass, klezmer, jazz, and swing in North America and Europe. Shelley, a professional folklorist from Toronto, is a versatile singer and multi instrumentalist who has spent a lifetime researching, teaching, writing about, performing, and sometimes composing songs. The trio is often joined on stage by fiddler and mandolinist James Stephens, a master of styles ranging from Irish to Cape Breton, bluegrass to swing. Surprises...The variety of these individual musical backgrounds makes for one of the distinctions of a Finest Kind performance -- the exhilarating mix of repertoire. British, American, Irish, and Canadian traditional ballads keep company with gospel rousers, drinking songs, sea shanties, and pop oldies. The timeless works of the Carter Family, the Copper Family, Rudyard Kipling, and Hank Williams mingle with originals by Ian or Shelley. Unencumbered by allegiances to any one style, Finest Kind presents the hand-picked best of many genres, and keeps audiences wondering just what delight they'll hear next.